Discussion in 'News & Announcements' started by ChrisTurk, Jan 27, 2019. Everyone will need an API Key starting Feb 1 Feb 7 in order to use TV with MTS. Delayed cutoffs by a week due to time constraints in getting the push out to Kada. The first month is free for every user. Once that first month ends the price is discounted at $5/month for users that sign up before Feb 1 Feb 7 and $7.99/month otherwise. MTS now has more reliable access to TV's dataset, meaning about a 40% increase in coverage across the board from less failed requests/etc as well as new features that right now only exist in MTS! 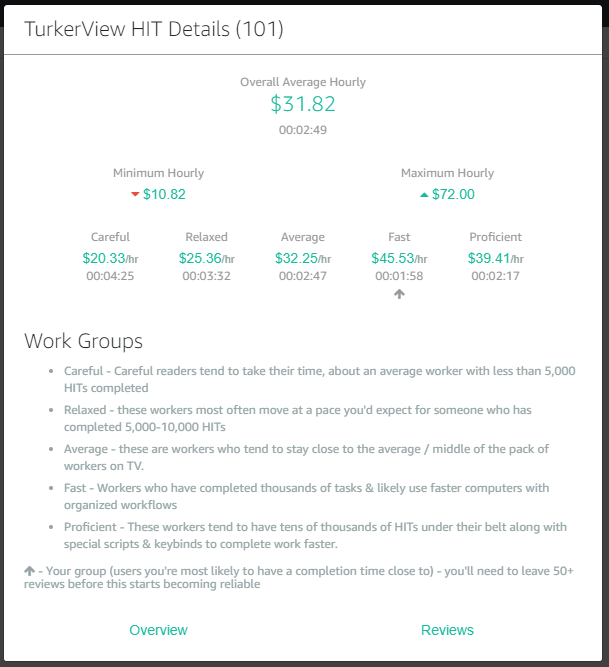 Advanced Task Breakdowns will show users more detailed results for individual HITs so they can get a more accurate idea of how long the task might take them. 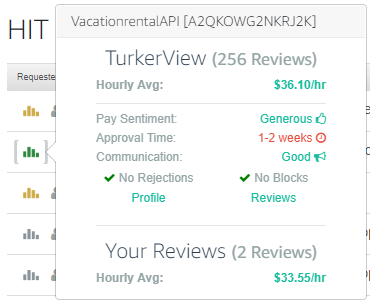 Leaving reviews on TV yourself greatly increases the usefulness of this tool so we highly recommend installing TVJS and reviewing HITs you complete! You can learn more about how to review on TV here. Want to avoid broken HITs, unpaid screeners, and requesters who waste your time & violate MTurk's TOS? Get real time warning alerts through TV's Return Review system! HIT Finder has received the same love as on-page popups & now has live access to TurkerView! TV's API should be pretty elastic, and I added some additional resources with the expectation adding MTS would be a significant load increase, however there are many aspects of the servers/infrastructure I cannot optimize until I see just how it responds to all 3 main services (TVJS, MTS, & Forker) being on the same endpoint. Please let me know by simply sending me a message w/ the time! It shouldn't happen often (and if it does, it shouldn't take me more than an hour to throw up more servers to handle it) but I'll be using this week to get a clearer idea of what the usage:resource ratio is really like before problems occur. I do not understand so bear with me - I use MTS only as scripts scare me. I like the help of the TOs and requester comments by workers but what is this new thing? do I have to do it? what if I chose not to, will I have absolutely no access to any kind of requester views? Over 130,000 hits so not a newbie but I am not doing everything - scripts to scrape, etc - to turk. TO is a completely separate system. In the past MTS has kind of blended all 3 together, I've changed that since TV is under active development & TO is more of a long term stable build at this point so I need to be able to make changes to TV without affecting their stuff. You don't need TV per se, and if you check it out & decide it isn't for you it can be turned off in MTS's options. How do I get rid of the announcement message at the top of Hit Finder in MTS? I do not want to install TV. I have it turned off in MTS options. I tried the Don't Show Again button and the message is not going away. I also see that the displayed message says it won't go away until we register for a key. I had a nightmare of a time trying to get my api key. I followed the video and when I clicked the links it just looped around. Finally I cleared my cookies and cache and tried it again and it worked perfectly. So if anyone else is having trouble give that a try. I am so lost. I do not understand any of this. What is TO? What is TV? I have MTS, but I don't see anywhere that TO or TV is mentioned on the options page. I am so lost when it comes to MTS too. I don't understand how to use it, and the wiki doesn't make any sense to me. I claimed the free API key, as instructed, and pasted it into the box on the notice on Finder. (I don't see any place to do that on the Options page.) I can click out of the box but the notice doesn't go away.. what am I doing wrong? I used to be good at computers (some 20+ years ago), but I only vaguely understand what a script is, and my understanding of extensions is only nominally better. Any help anyone wants to give would be greatly appreciated. 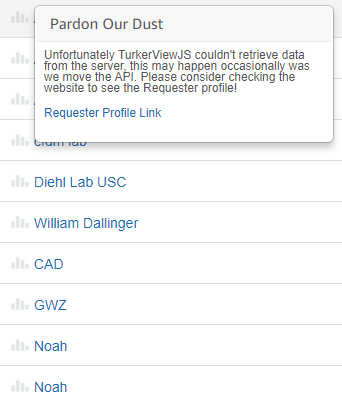 I would love to figure out how to make more than $4/hr on MTurk. TO and TV are hit review sites. TV is the one associated with this forum. 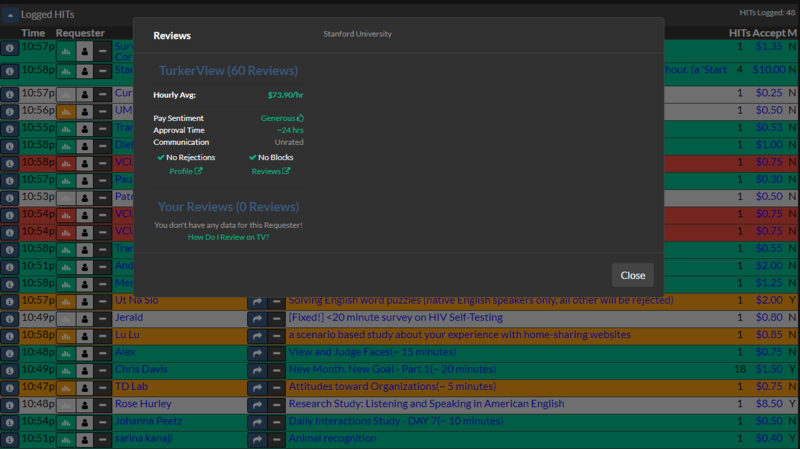 If you click on Turkerview in the bar up at the top you'll find reviews so you can look up information about requesters. TO is another review site that has been around for a long time. I think the biggest difference is that TV is curated so you have to do the hit to review it and it is monitored to make sure the reviews are reasonable. I very much prefer this, but I'm biased some people like the free for all that is TO. You said you use hitfinder. This information is summarized by the colors. Red is bad, yellow is medium, green is good. If you click on one of those icons a summary of the reviews from the different sites comes up. For general questions come on over to the daily thread. That's where everyone hangs out. It's a little hectic over there, but you'll get responses to questions pretty quickly in general and everyone's(mostly) helpful. Look at what people are posting that their working on and just soak up the information. That helped me a lot when I was starting out. You should see them both mentioned if you open MTS Options and scroll down to the section labelled "Requester Reviews"
I had TV unchecked but it was still stuck on there. The update to MTS finally fixed it. Thanks for the help.